I'm a coach, author and trainer. My work allows you to embody the wisdom of your life experiences and live creatively with meaning and purpose — free from the constraints of others’ beliefs. You can stop searching — and start living! You know how sometimes you feel like you're ‘in the groove’? Synchronicities occur. All of life seems to flow effortlessly. Some of those synchronicities are so wild and awesome; they blow your mind. You’d like to experience more of those moments, but you’re not quite sure how or why they occur or whether you can create them intentionally. I’m here to tell you that you can! 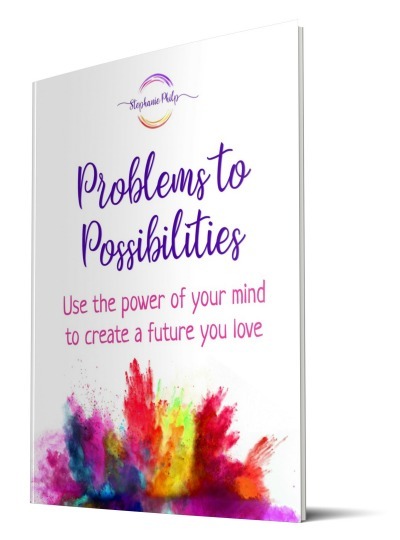 I want to get you started on creating a future you'll love, and to show you how to do that consciously, through the power of your mind. 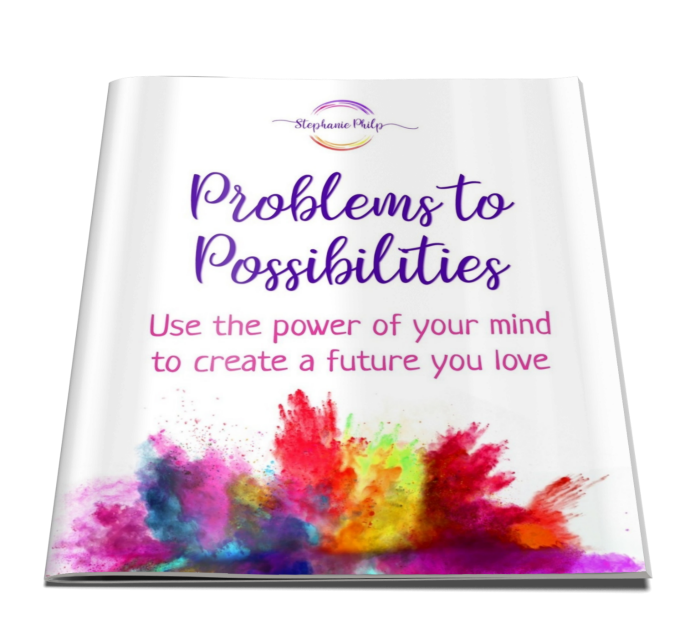 Download my free 6-step Guide, 'Problems to Possibilities' and start today! Stephanie is unique, smart, funny and kind. If you have the chance to work with Steph, TAKE IT! I wanted to learn how to create a reality which is perfect for me. Now, I have no doubts about myself and I have an enormous feeling of happiness and joy. That joy makes people turn around and wonder what happened to me. Thank you Steph! I learnt that I am totally capable of achieving a more positive life using the skills Stephanie taught me. I feel more grounded and able to make healthier decisions for myself. Steph has a wonderful, welcoming presence and is open and understanding, wanting to assist in finding out what makes people tick and to help them be their better selves. The biggest benefit I received was the confidence and freedom to be me, to believe in me, to let others see me. There is no question I am going to realise my goals. New opportunities have opened up already and I am much more confident and skilled to move ahead with my plans. Nothing compares or even comes close to what I got from working with Steph. Stephanie, thank you, thank you, thank you for all your wisdom, knowledge, humour and most of all your support and encouragement. If you want to reach your potential, let Steph’s unique style guide you through an amazing life changing learning experience so you can make the most of your one, very precious life. 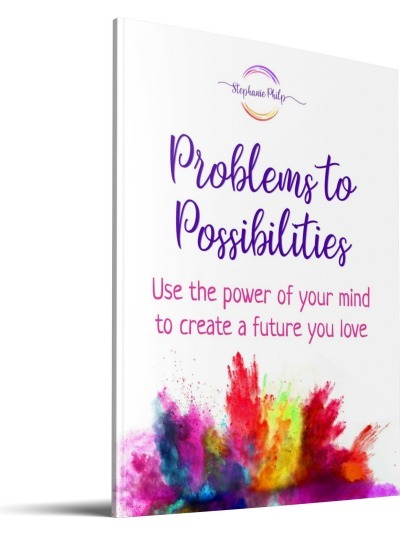 Download my Problems to Possibilities Guide. It will only take you a few minutes to read. You'll discover some inspiring, yet simple examples of how the conscious creation process works — and why it sometimes feels as if it doesn't work. You'll discover critical information (learned from personal experience and years of training) that you won't learn anywhere else. It's a longing that comes from deep within. Your inner knowing tells you that when you are more — you can give more. There must be a way of gathering together all the learning from your years of unique life experiences, so you can make use of them now to change direction a little — or maybe a lot! But then there's that insistent little voice in your head. She tells you you should be grateful; she reminds you of how much you already have. Or she tries to persuade you that you should have done something before now — like, 10, 20 or even 30 years ago. That it's too late now. In fact, all your years of living have bought you to where you are now — the perfect place from which to launch yourself into a new phase of life. And as for wanting more — it's human nature to want more; more connection, more living, more abundance, more sharing. I understand that yearning. It might be so big that it feels overwhelming. Or sometimes, it feels like this nebulous, foggy ‘thing’ that’s just out of reach and difficult to grasp or verbalise. And yet it calls you to be more — to move beyond where you are now. They impact and positively transform the world, inspiring human and societal progress. And while your ideas may be big, you can still be your authentic self. In fact — authenticity is essential. 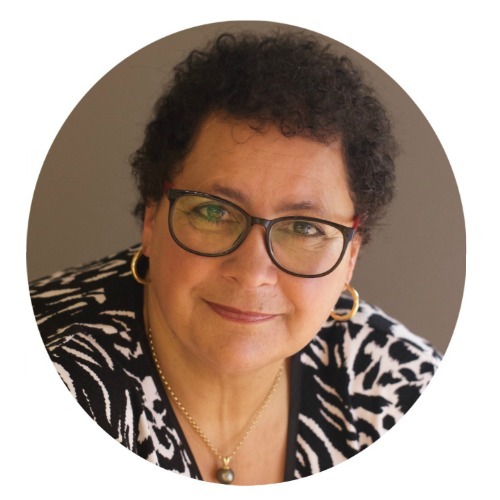 "Steph’s, easy, creative and humorous Guide imparts valuable insights into life, and supports me exploring new ways of looking at myself and the world."